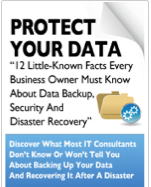 12 Little Known Facts About Backups | PC.Solutions.Net . : We make nets work! :. Business owners should be familiar with these facts to not only make sure they understand the technology but also to be able to make the right decision for the success of their business. and consider regarding data security.